"I am sorry to say our photographers have not been very busy lately, on account of sickness or bad conduct..."
The first Sappers were taught photography in 1856 by Charles Thurston Thompson (1816-1868) at the Kensington Museum (now the Victoria and Albert Museum). A Royal Engineer survey team arrived at Esquimalt in July 1858 to establish the 49th parallel. Among their numbers was one photographer who deserted in the spring of 1859 to the U.S. Also with this group was a civilian photographer, Arthur Vipond, who had trained in 1857-1858 under Thurston Thompson. Two more Sappers trained in photography arrived as replacements in October 1859 and practiced with the equipment by photographing in and around Victoria. Charles Wilson, in the field near Chilliwack, mentions taking photographs in October 1859. Most of the photographs taken in 1860-1861 were made in the Fort Vancouver, Cascades and Dalles area of Washington and Oregon. 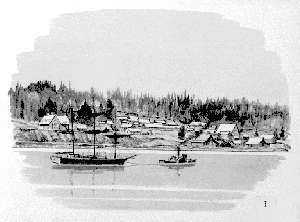 In addition to the boundary survey team, the Columbia Detachment of Royal Engineers was stationed at New Westminster, Colony of British Columbia, from December 1858 to 1863. DIED: 25 October 1905, Tunbridge Wells, UK. REFERENCES: BVIPA, Wilson diary (original); Wilson (1970):75.